I like the berries in your mix, they work well together with a definite accent on blue and darker berries which fits your forest theme. The TPA Graham Crackers gives body I suppose? I do not get granola or biscuit in any way. But what I'm missing here is the yogurt. You can go much higher on TPA Greek Yogurt before it becomes a main note and before its tang comes through. You do advise that peopke can bump it up to 5%, why not do that right away? Also I would bump it to 8% without hesitation. I definitely did not use 1% of Super Sweet, that would be way too sweet for me. I did 0.5% of FW Sweetener. All in all a nice mix, I like it, but I think you could push this mix further by adding more TPA yogurt and working on a real granola base. Your berries are really spot on and pleasant. Good job! I'm really surprised this doesn't have any reviews yet, because this recipe really showcases how much potential there is in the low-key-popular FA Forest Fruit. I used less sweetener than the recipe calls for (probably around .6%), and at that level the vape gives a satisfying, sharp/sour note on the inhale before resolving into a rich and creamy ripe/sweet berry that preserves just the right amount of the initial tang. To me, that tang is mostly berry, and I feel as if the sour yogurt notes are expressed as part of (rather than alongside) the berry. 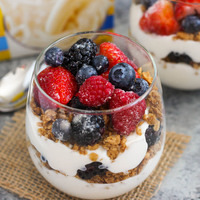 But I actually consider that a positive, because it's as if the dairy profile is a sweet cream that's absorbed flavor from a handful of berries. You just want to drink it, and in every gulp you get a fresh, sharp berry or two to balance out the sweetness. One way or another, if you like FA Forest Fruit, absolutely mix this up. It's excellent work.